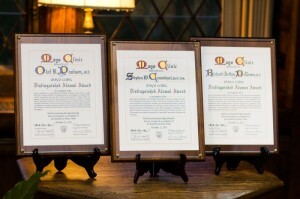 The Mayo Clinic Distinguished Alumni Award was established in 1981 by the Mayo Clinic Board of Trustees to acknowledge and show appreciation for the exceptional contributions of Mayo alumni to the field of medicine, including medical practice, research, education, and administration. Individuals receiving this award are recognized nationally — and often internationally — in their field. *Mayo Clinic staff who are members of the Mayo Clinic Alumni Association are ineligible unless retired or 70 years of age or older.